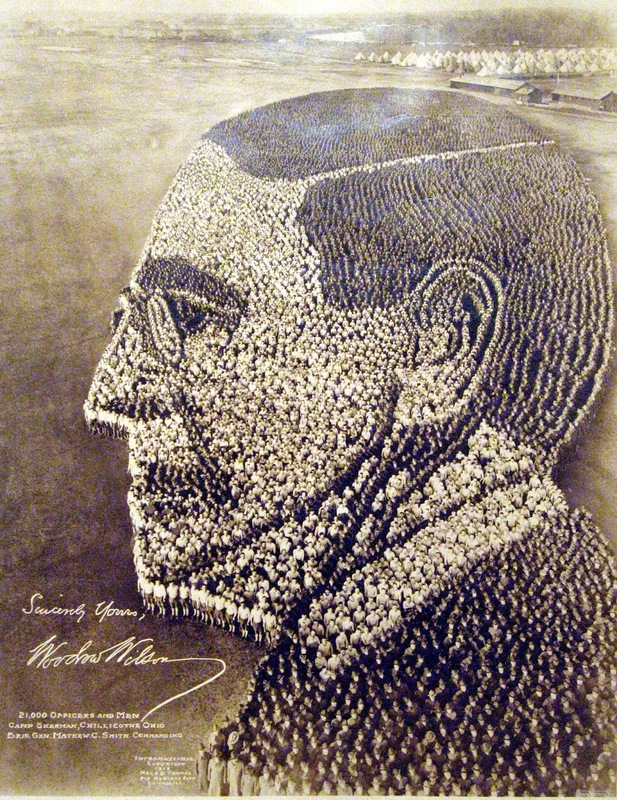 Living Portrait of Woodrow Wilson, 1918, Camp Sherman Ohio, 21,000 officers and men. Tens of thousands of soldiers, reservists and other members of the military were arranged to form massive compositions. 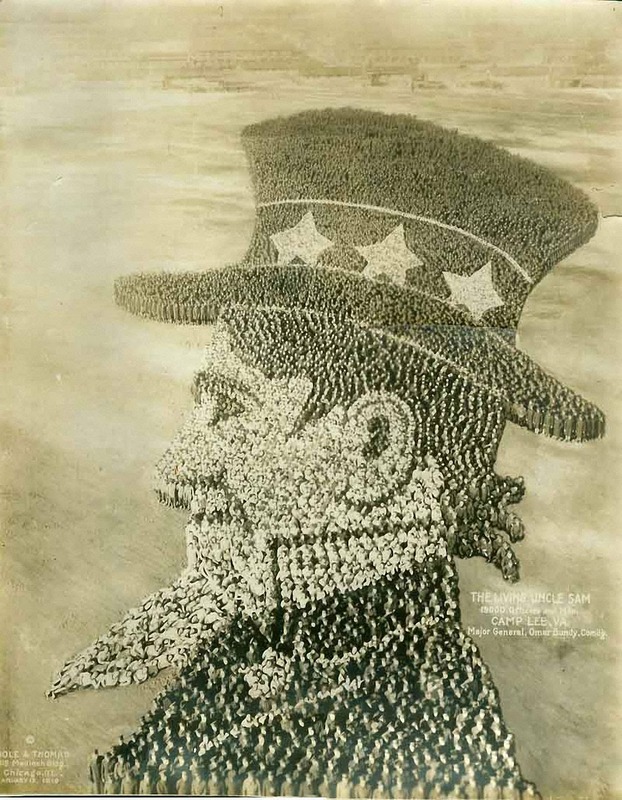 Although if viewed from the ground or from directly above, these masses of men would appear meaningless, when seen from the top of an 80-foot viewing tower, they clearly appeared to be various patriotic shapes. Almost a century ago and without the aid of any pixel-generating computer software, the itinerant photographer Arthur Mole and his colleague John D. Thomas used an interesting technique to stage a series of extraordinary mass photographic spectacles that choreographed living bodies into symbolic formations of religious and national community. In these mass ornaments, thousands of military troops and other groups were arranged artfully to form American patriotic symbols, emblems, and military insignia visible from a bird’s eye perspective. During World War I, these military formations came to serve as rallying points to support American involvement in the war and to ward off isolationist tendencies. The Living Uncle Sam 1919 Camp Lee, VA – 19,000 officers and men. The most intriguing thing about these images is that Mole called them “living photographs”. From the photographer’s perspective, the emblems are brought to life by means of the living soldiers who embody them. But one can also look at these images from the opposite perspective: we deaden the human beings into form and formation by making them into emblems. Mole & Thomas were using 11 x 14 inch view camera, which was positioned on a 24-meters-high tower (80 feet). Firstly, they put the outlay (wireframe) of a desired image on a glass plate in Mr. Mole’s camera. Then, with help of assistants, the image trace that was seen from the camera, was “transferred” to the ground beneath the tower. Armed with a megaphone and a long stick with a white flag on it (so it is seen from the distance), Mole was able to show the assistants how and where plot the curves of the desired image. The preparations for the shoot took several weeks and the actual positioning of people—several hours. It was a pretty remarkable display of planning and logistics skills. 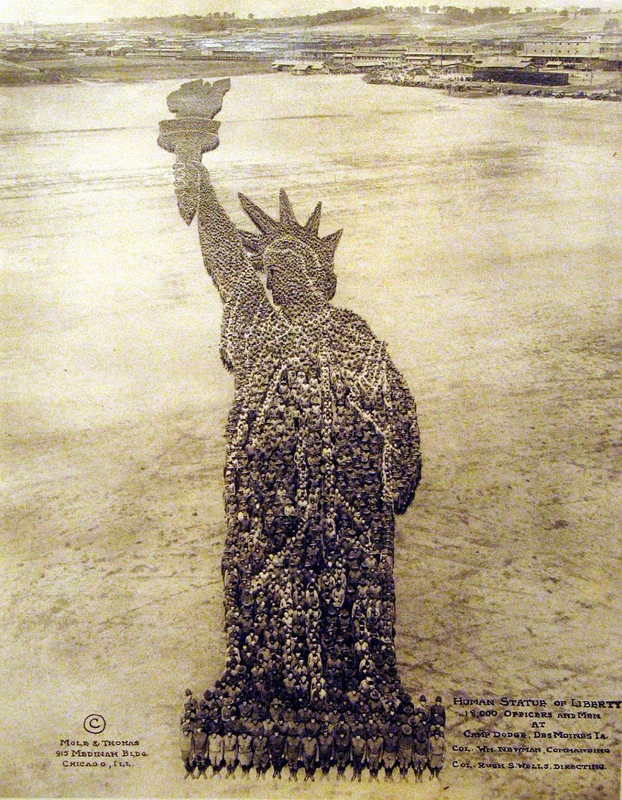 Human Statue of Liberty, 18,000 officers and men. Due to a perspective distortion, there are more men at the top of the Mole & Thomas photos, than there at the bottom. For example, in “Human Statue of Liberty” photo, the flame of the torch was formed with help of 2/3 of a total number of men available for the photoshoot. Roughly speaking, out of 18,000 people, the whole torch element took in 16,000 men, while the rest of the “statue” was formed only using 2,000 people. On a stifling July day in 1918, 18,000 officers and soldiers posed as Lady Liberty on the parade [drill] grounds at Camp Dodge. [This area was west of Baker St. and is currently the area around building S34 and to the west.] According to a July 3, 1986, story in the Fort Dodge Messenger, many men fainted — they were dressed in woolen uniforms — as the temperature neared 105°F. The photo, taken from the top of a specially constructed tower by a Chicago photography studio, Mole & Thomas, was intended to help promote the sale of war bonds but was never used. 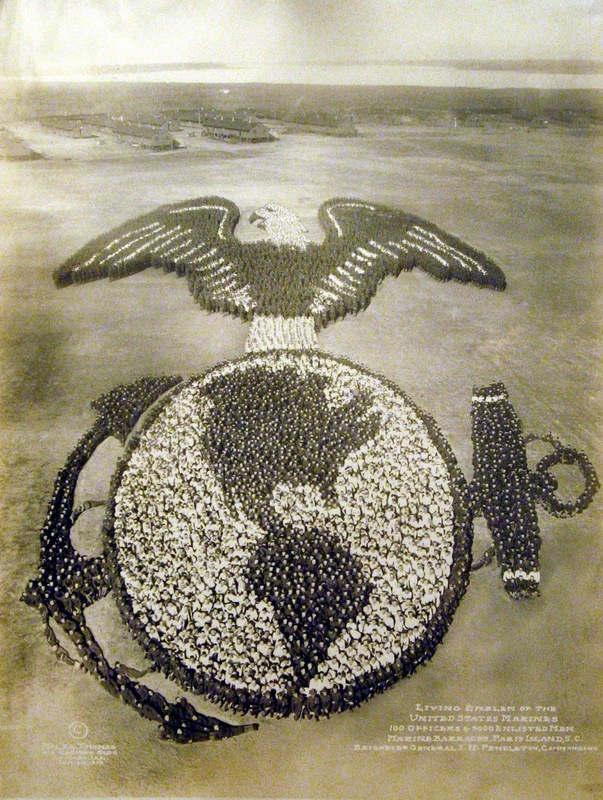 Living Emblem of the United States Marines. 100 officers & 9,000 enlisted men.. 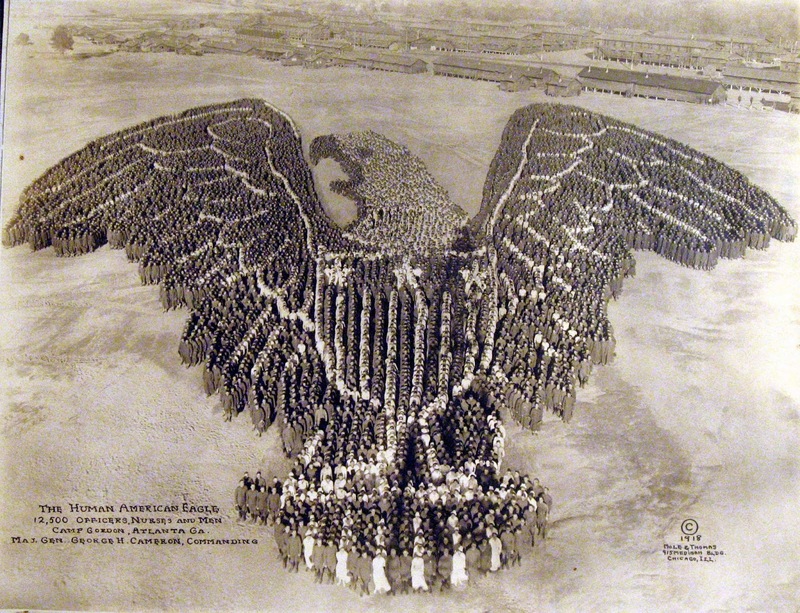 The Human American Eagle, 1918, Camp Gordan, Atlanta Ga. 12,500 officers, nurses and men. 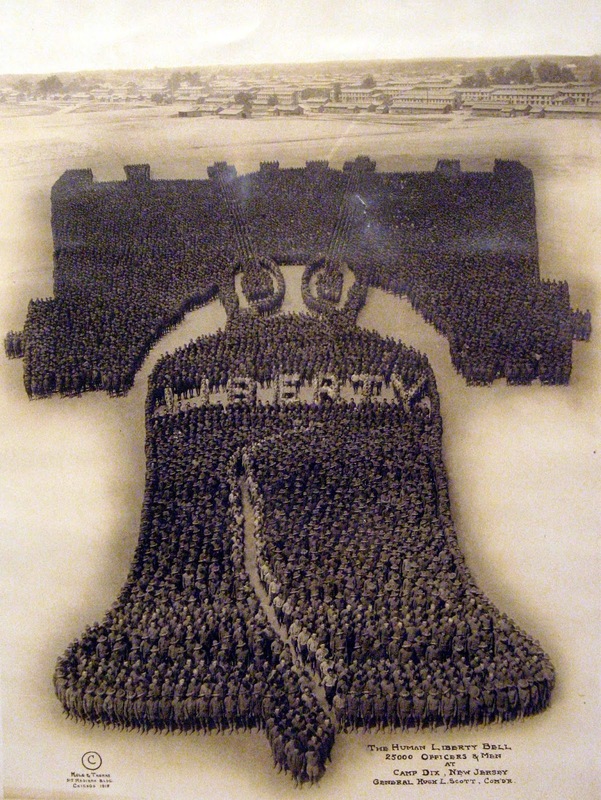 The Human Liberty Bell, 1918, Camp Dix New Jersey, 25,000 officers and men. 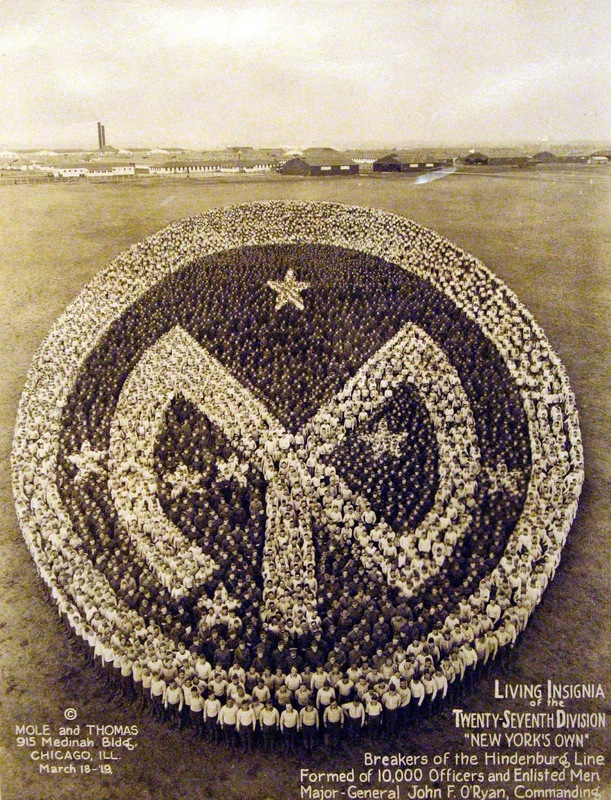 Living Insignia of the 27th Division, 1919, 10,000 officers and men. 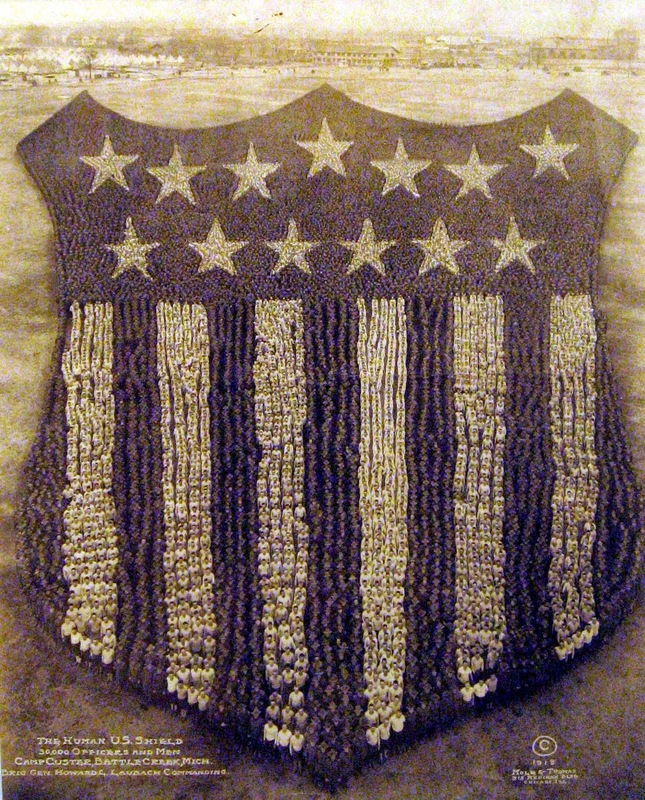 The Human U.S. Shield, 1918, Camp Custer, Mich. 30,000 officers and men. 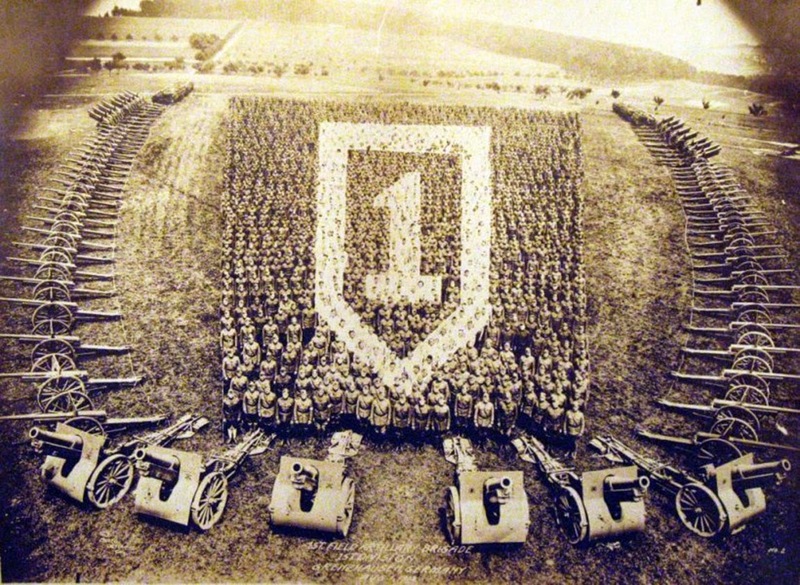 Grenzhausen, Germany, 1st Field Artillery Brigade, 1st Division, 1919.